We are very proud of our portfolio of retail shopping centres. They continue to provide excellent returns for our shareholders because we attract major retailers at great locations where consumers love to shop. SmartCentres’ income-producing properties form the foundation of our business, and for good reason: they continue to realize excellent returns for our Unitholders. With major tenants in well-designed, convenient locations near major population areas, SmartCentres’ large-format shopping centres perform consistently well, serving consumers seeking value-focused retailers. Our goal with all our tenants is to provide efficient environments that make shopping easy and convenient for their customers, while keeping operating costs low. Customers take advantage of a one-stop shopping location, while retailers realize greater sales in spaces tailored to their specifications. SmartCentres® directly manages all operations of our 100% owned shopping centres in-house. This approach enables us to continue to create value, not only for our shareholders, but it enables our tenants’ retail spaces to thrive. 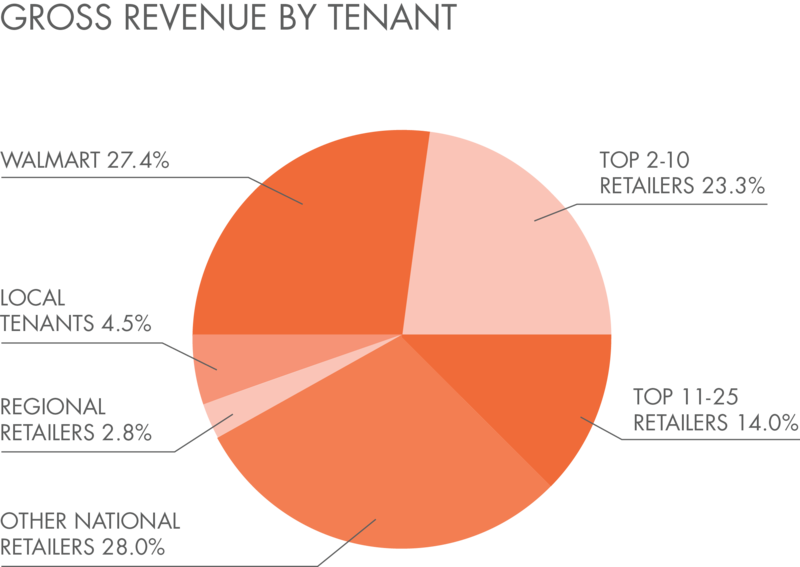 One such tenant is Walmart, which anchors 115 of SmartCentres’ shopping centres. With a highly visible presence in Canadian retail, Walmart helps generate significant volumes of customer traffic, further strengthening SmartCentres’ presence in markets throughout the country.